On the day of the Great Emergence, the lord of the Inhumans has deemed one of his young citizens worthy of receiving the transformative Terrigen Mists. The Mists unleash the process of Terrigenesis within the body of the receiver – developing the child’s inner potential super powers or mutation. And, as the moment of Terrigenesis approaches, the honored child’s parents grow concerned that they may unleash a dangerous or deformative mutation. But, before the Terrigenesis ritual can progress, the Great Emergence must first occur. And, after fifty years, the lord of the Inhumans bears witness to the emergence of Black Bolt from his stasis pad. Years prior, when the Mutant Registration Act was enacted, the Inhumans took to the stars in an enormous vessel. Black Bolt and the rest of the ruling class entered cryogenic stasis but, Maximus broke out early and became the lord of the Inhumans. Maximus the Mad killed the others (Medusa, Gorgon, Crystal, Triton, Karnak) while they slept in their cryogenic pods. 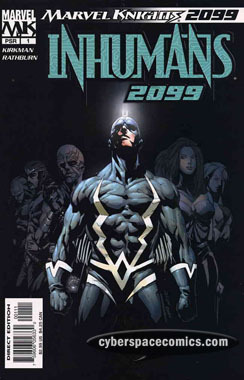 And, all this he has just revealed to the newly-risen former leader of the Inhumans, Black Bolt. With but one word, Black Bolt has his revenge on his mad brother … and ultimately dooms his entire race by destroying their spacecraft and leaving them unprotected from the ravages of deep space. There’s a lot of set up here for Inhuman characters that ultimately have no bearing or importance on the larger story of the brothers, Black Bolt and Maximus. I feel that there were far too many pages devoted to these minor characters instead of developing the plot line of Black Bolt’s return. Additionally, the art wasn’t al that great, either. I’d skip this one if I were you.